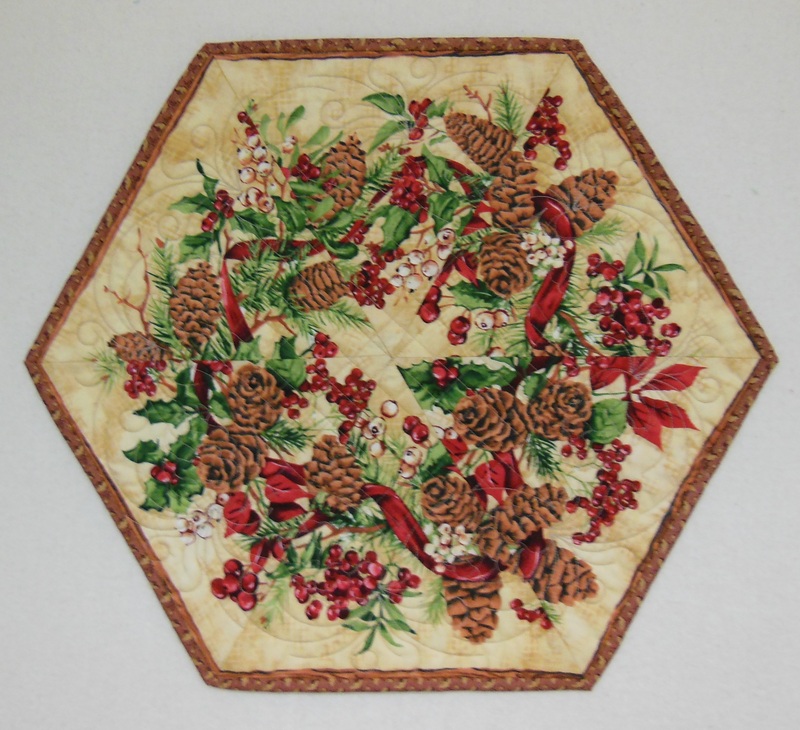 This small table topper was made from a small strip of border print. 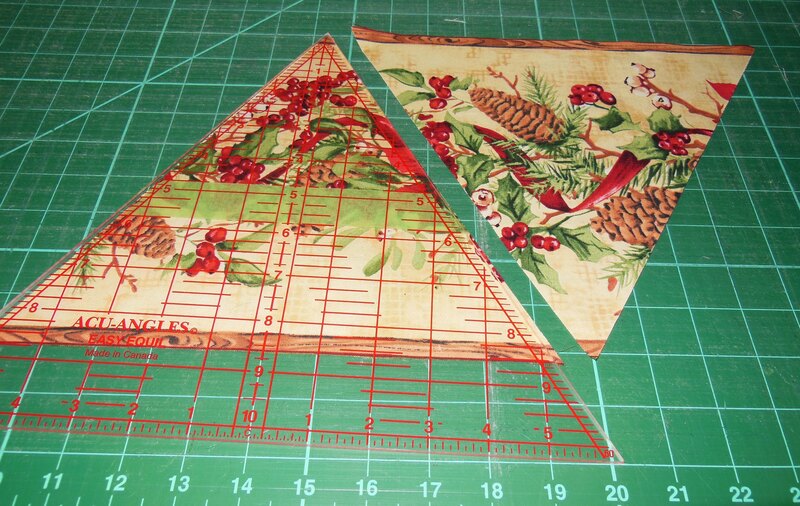 It is assembled from 6 triangles, cut alternately from the border strip. Once cut, the triangles were rearranged to form a hexagon. Assembling it is easiest when three triangles are joined to form one half of the hexagon. Then the two halves are sewn together, taking care to match the center seam. 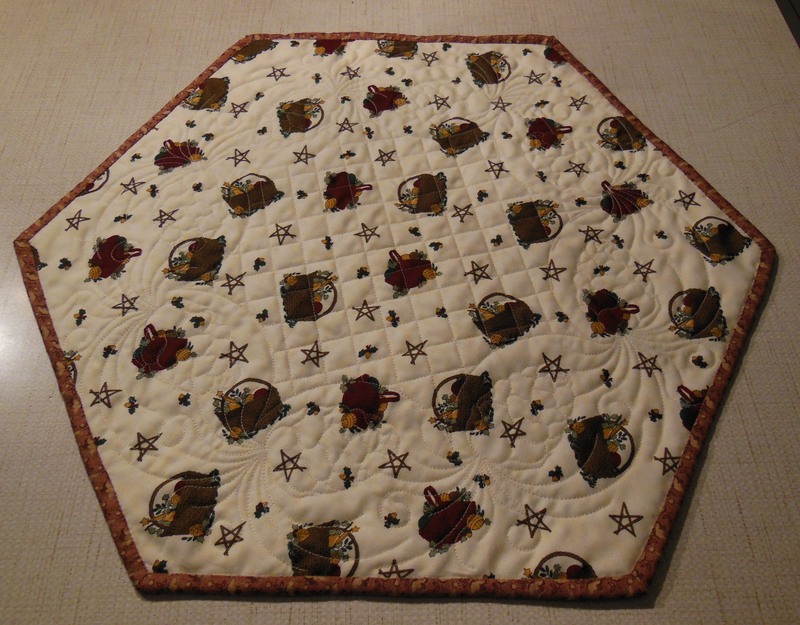 I quilted the topper with a digital design called Majestic Pines by Donna Klineke of One Song Needle Arts. I used Shape Shift to pull the design into the corners of the hexagon. The tread is a camel colored So Fine on top and an off white Bottom Line in the bobbin. The back of the table topper shows the design more clearly. 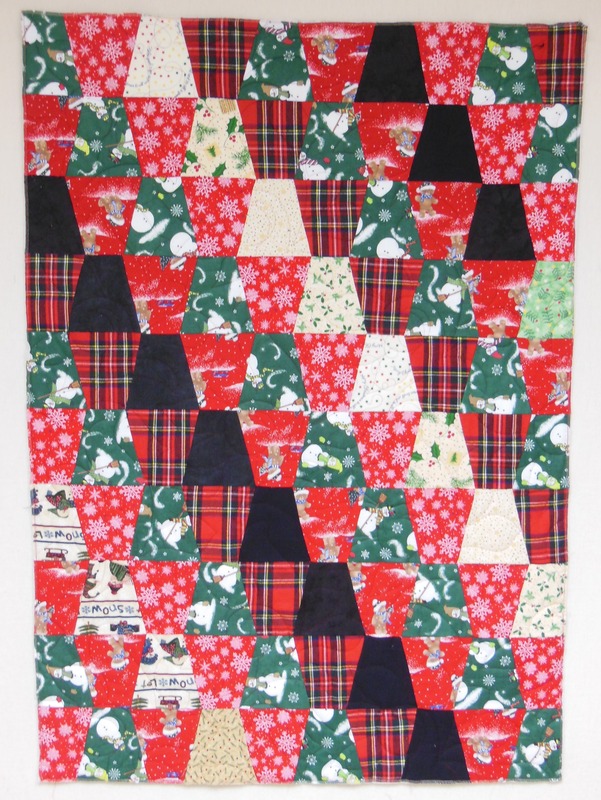 The topper fabric is appropriate for most of the winter, even though it is a Christmas print. The backing is a Hanukkah print, so I think of this as my multi-faith table topper. I can flip it over for the appropriate holiday celebration! The binding is applied to the front and hand stitched to the back. I chose to do the binding by hand because we had a trip out of town and I needed something to do on the long drive. So now it is done! 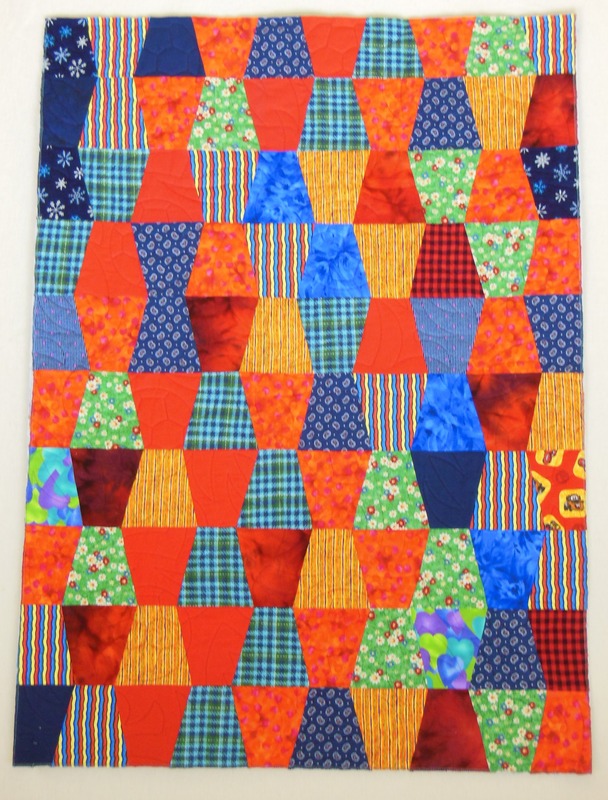 This quilt is made with a top I bought on eBay. The sides are all bias edged triangles. 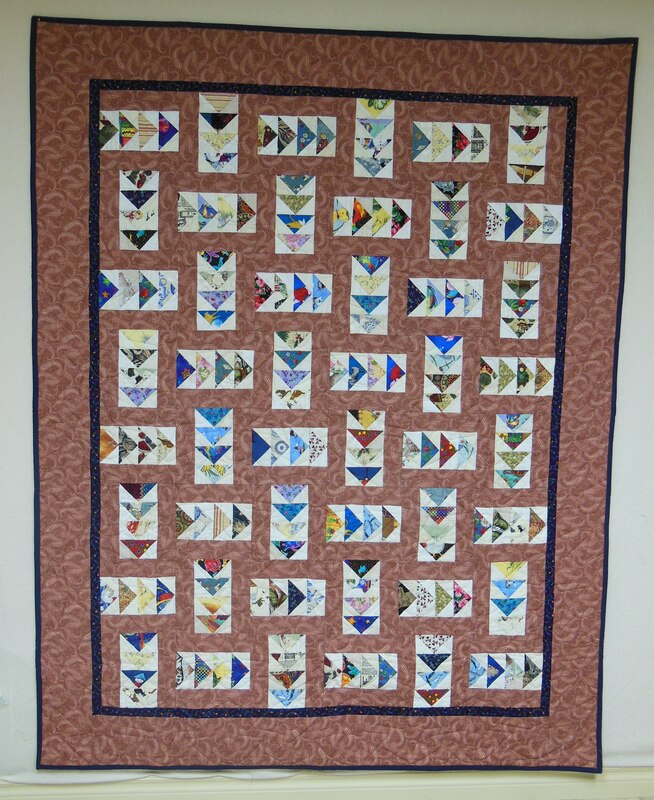 The top sat in my cupboard for a few years till a few months ago, when I pulled it out and quilted it with a pantograph. With the four bias sides, it was a challenge to keep it square and flat, but with some fussing and fiddling, I managed to do it! The finished quilt turned out much better than I expected. 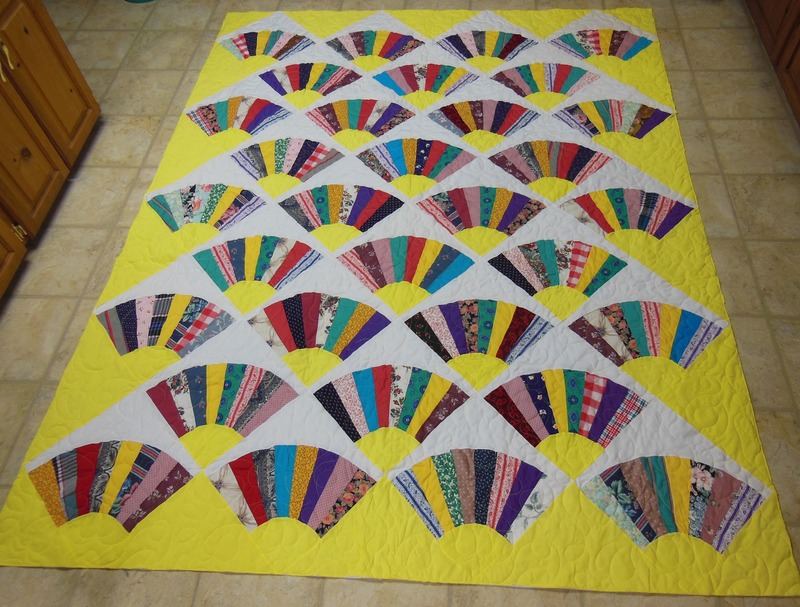 Friend and guild member Nancy added the binding and it has now been donated to the organization Women in Crisis. Hopefully it will bring comfort to someone who has fled her home with nothing. 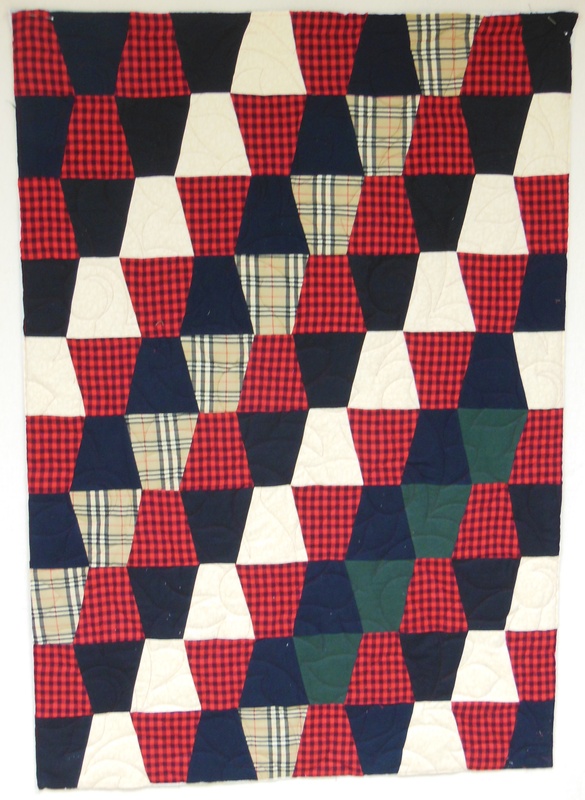 This modern quilt was dropped off at my door by Leslie, the owner of Reichart’s quilt store in St. Jacobs. I expect it was a shop sample. I do not know if it was made by Leslie or by one of her staff. 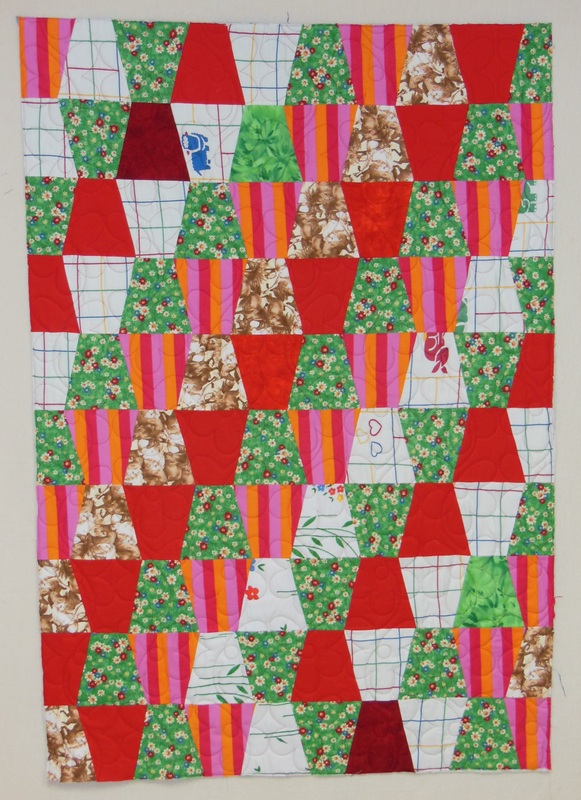 Leslie asked if this quilt could be finished and donated to Women in Crisis. I was happy to oblige her, as Women in Crisis is one of the groups our guild is supporting this year. (Thanks, Leslie!) I do not know the name of the pattern. 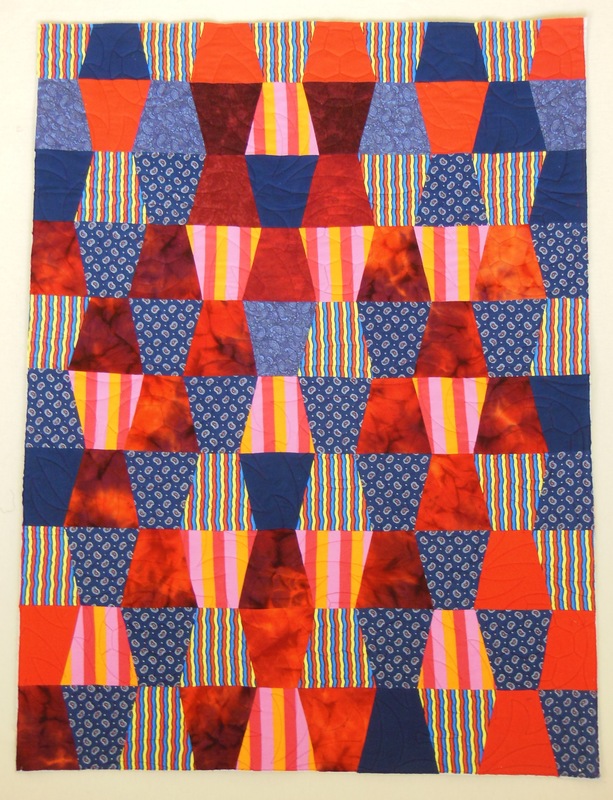 I saw a quilt of the same design hanging at the Mount Forest quilt show yesterday, so I suspect it is a commercial pattern, but have no idea who designed it. Anyone know? 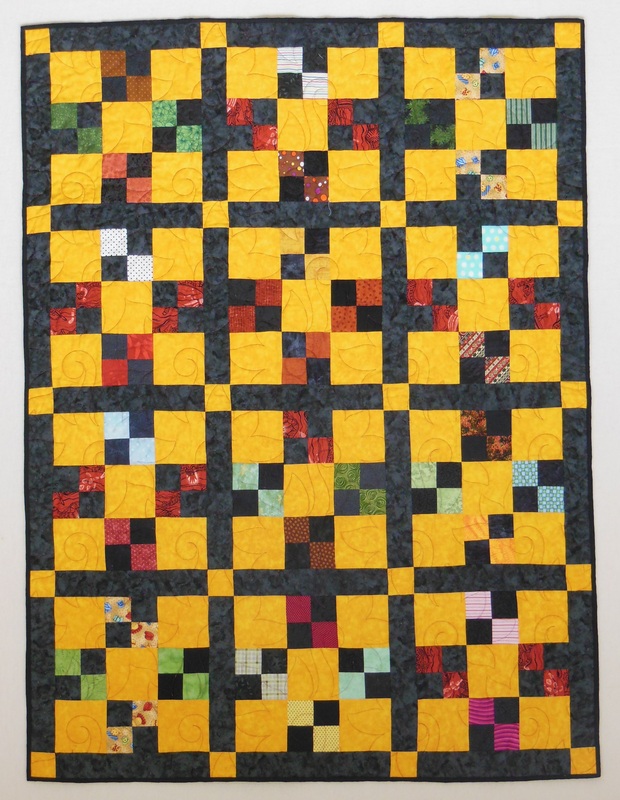 The quilt has now been dropped off to guild member Kay, who will add the coordinating blue print binding and guild label before Wednesday when she will bring it to the guild meeting to be donated to Women in Crisis. (Thanks, Kay!) It is great to have a team of committed women who all do a small part to accomplish big things. Since I returned from Paducah, I have been working feverishly to finish some client quilts and a group of community outreach quilts. 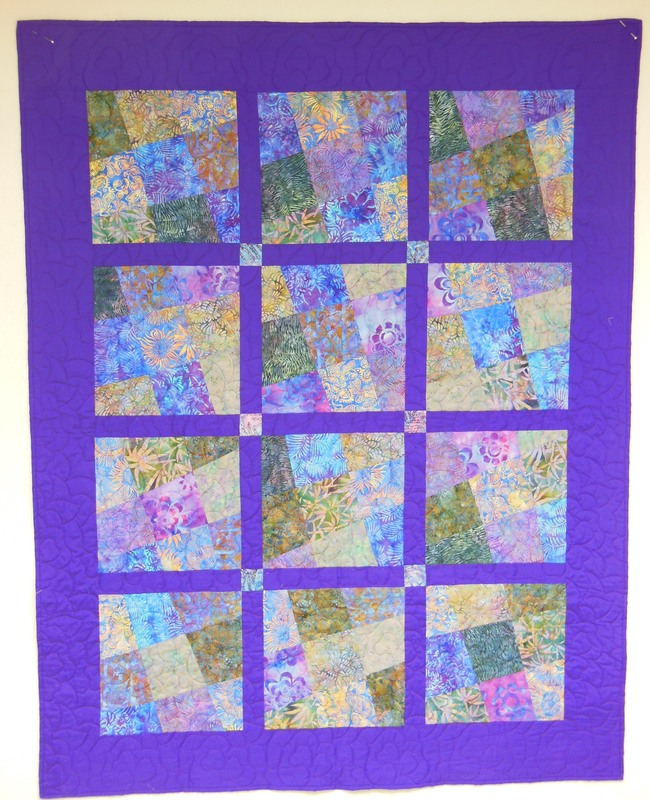 On Wednesday next week, we will be donating a large group of quilts to Victim Services and another six to eight quilts to the group Women in Crisis. One of my goals as chair of the community outreach committed was to use the stash we had on hand. 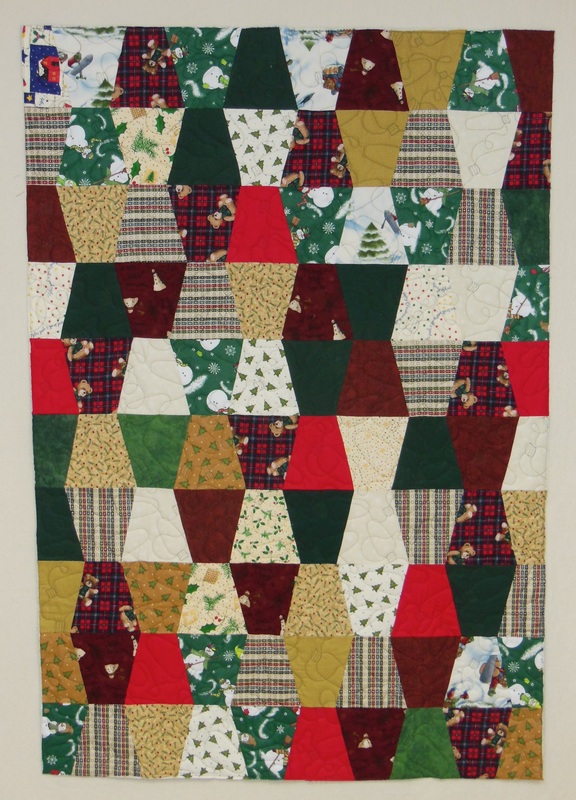 During the winter, we had a few cutting days when we cut all of our scrap flannel pieces into tumbler blocks, using my AccuQuilt Studio cutter. Then we sorted the fabrics into 30 color coordinated packages of 100 tumblers, When set 10 across and ten down, they make a quilt about 44 by 60 inches. 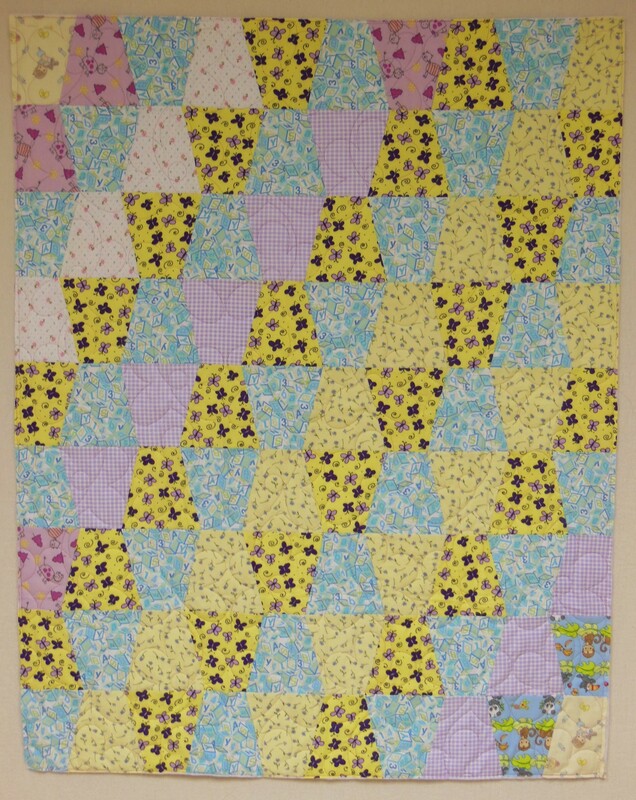 Members of our guild then signed out the kits and assembled the quilt tops and returned them for quilting. 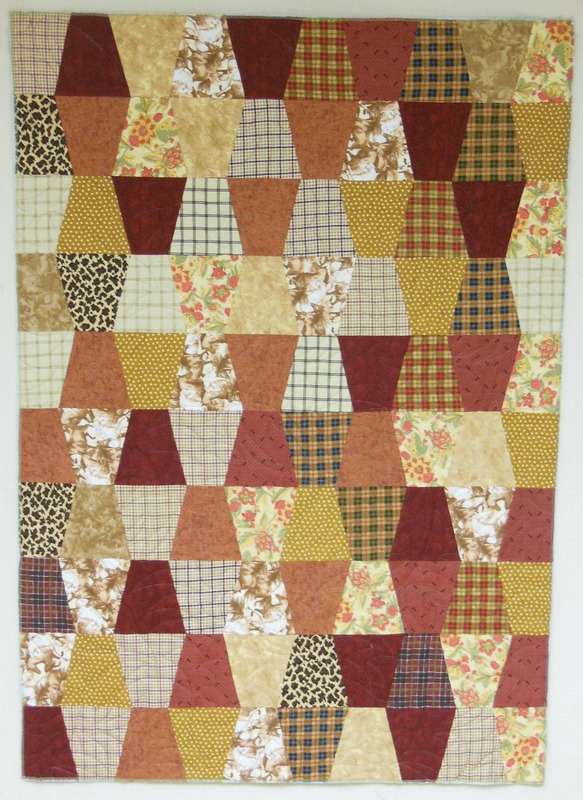 Here are the resulting tops, now quilted. They went out yesterday to other guild members, Joan, Kay and Judy for binding and labeling. These all will be donated on Wednesday to Victim Services. 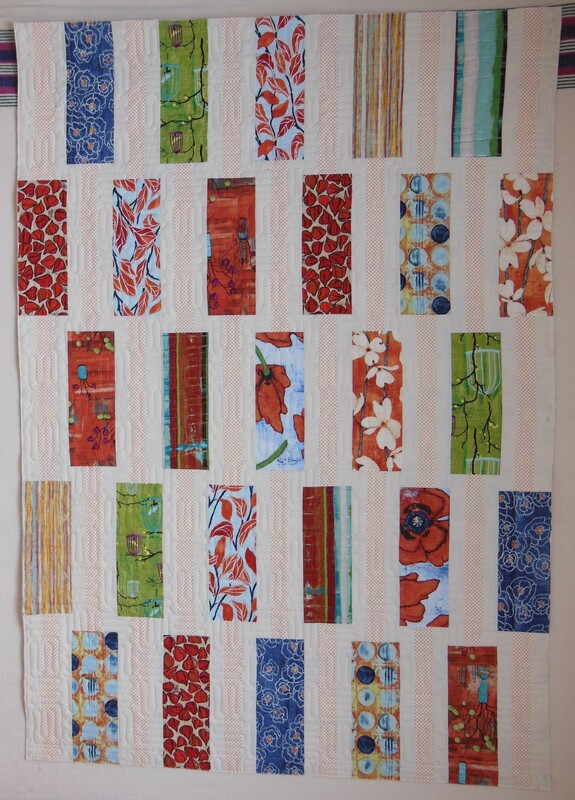 I’m delighted with the wonderful quilts made from a pile of seemingly chaotic scrap. Don’t they look great?